Now you can add money to the list of things Canadians can send over Facebook Messenger. In another sign of the increasing commercial potential of instant messenging programs, London-based P2P money transfer service provider TransferWise released a new bot on Tuesday that allows users to send international money transfers using the popular instant messaging app. The company also noted that it was the first to offer a Messenger-led P2P international money transfer service in Canada, an especially appropriate market given that 20 per cent of Canadians were born outside the country and that, according to the most recent data available from the World Bank, close to $24 billion left the country through remittance transfers in 2015. In addition to transferring funds, users can enable the bot to set up rate alerts for their favourite currencies, with TransferWise offering mid-market exchange rates – the same you would find on Google or the Xe Currency Converter. The TransferWise Messenger bot in action. Courtesy TransferWise. Eventually, TransferWise said, the service will expand to all 50-plus countries supported by the company. Presently, however, the service can only be used to send money from Canada, the U.S., U.K., Australia, or Europe. 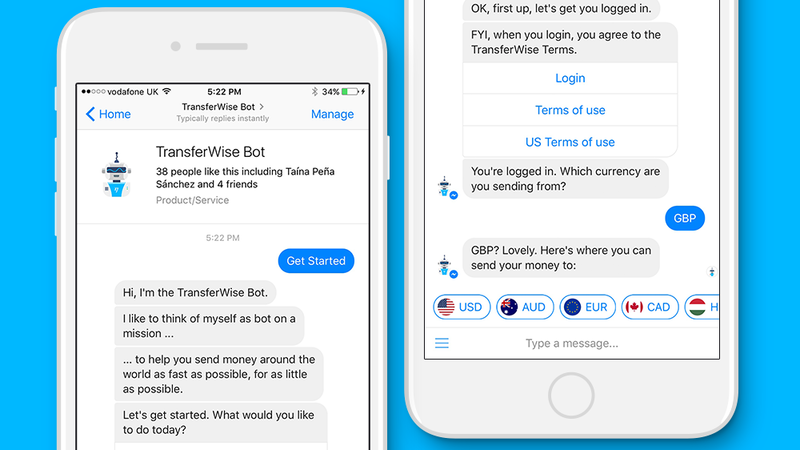 Users can access the TransferWise bot from Messenger by clicking here.